We will be showing The Hate U Give, based on the bestselling book by Angie Thomas. Pizza will be provided. 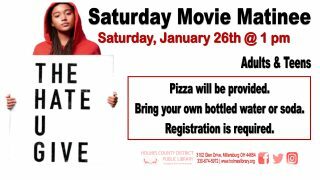 Bring your own bottled soda/water. Registration required. This FREE program is for adults and teens.